The Lesser of Two Menaces – Multiflora Roses vs. Erosion? Comments Off on The Lesser of Two Menaces – Multiflora Roses vs. Erosion? 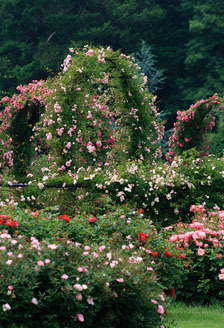 This time of year finds the air in many Connecticut locations replete with the soft scent of roses. While this light but alluring fragrance might conjure up pleasant musings of that past, present or future summer romances, in reality it springs from an obnoxious, invasive shrub, the multiflora rose. Multiflora roses hail from Asia and were brought to the U.S. around 1860 as ornamental plants and to serve as rootstocks in rose breeding efforts. Later in the 1930s, they along with several other quick growing, Asian plants such as bush honeysuckle and autumn olive were recommended for erosion control, wildlife habitat improvements and even living fences. 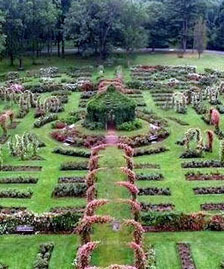 The use of multiflora rose and the like was even encouraged by the newly formed USDA Soil Conservation Service. These non-natives were planted throughout the northeast and Midwest and it wasn’t until the 1960s that conservationists began sounding the alarm about their invasive nature. Their use was still encouraged for a decade or two longer. Now multiflora roses are classified as a noxious weed in many states. It is fairly easy to identify multiflora roses right now as its long arching stems or canes can easily reach 6 to 15 feet in length. A single shrub may have a somewhat pendulous appearance but more often colonies of multiflora roses clamber over each other and up anything growing near them including other large shrubs or trees. From late May through mid-June the plants are covered with clusters or corymbs of 5-petaled white or sometimes pale pink, fragrant flowers. The individual blossoms are three-quarters to one and a half inches in diameter and when fertilized go on to produce red rose hips in the late summer. Multiflora rose scrambling up a tree. I’m not sure who counted them but several sources attest to a large multiflora rose plant being capable of producing 500,000 or more rose hips. The quarter-inch rose hips linger throughout the winter and serve as a food source primarily for birds who end up spreading the seeds via their droppings – just in case you might be wondering why there is a rose sprouting amidst your perennials. Seeds can remain viable for 10 to 20 years, germinating when conditions are right. Multiflora rose hips, Photo by dmp. The pinnately compound leaves usually have 7 leaflets but that number may vary from 5 to 11. The leaves are a glossy green, alternate and have a fringed stipule at the base of each leaf. The long canes are covered with recurved thorns making gloves mandatory for handling this plant. The pinnately compound leaves of the multiflora rose typically have 7 leaflets. Aside from the thorns, what makes the multiflora rose so obnoxious? It displaces native plants! Multiflora roses can reproduce by seed, suckers and tip layering. Because the birds eat the seeds, they can be dispersed quite a distance away from the parent plant. As the plant sends up new suckers or stems, each is capable of producing flowers and more rose hips. Large areas can easily be colonized by this plant which effectively competes for water, nutrients and light making these necessities less and less available to native plants whose numbers dwindle. Also, plants leaf out earlier than many of our natives – just like Japanese barberry does. Early leaves means plants get a jumpstart on photosynthesis for earlier growth and vigor. Multiflora rose can grow in sun or part shade, and in moist or dry spots. As far as I am aware, the multiflora rose has no native predators. Deer and woodchucks leave it alone. I have not even found slugs on this plant. There are 2 non-native insects that offer some control – the rose stem girdler beetle and the rose seed chalid wasp. Rose stem girdler beetles lay their eggs on the stems. After hatching, the larvae enter the stems and feed in effect girdling them. Stems may bend or break as their inner components are consumed by the larvae. This insect can attack garden and native roses as well as brambles. Rose stem girdler damage. Photo taken by James W. Armine Jr., West Virginia University, Bugwood.org. The rose seed chalid wasp was imported from Japan and feeds on developing seeds. Fewer seeds maturing means less new plants will sprout reducing the infestation to some degree. One native virus offers some control of the multiflora rose. The rose rosette virus (RRV) is spread by the tiny eriophid mite. It can kill a rose bush in 2 to 3 years. This virus causes growths known as ‘witches brooms’ to form that look like a cluster of stems squashed together. Usually they are a distinctive reddish or purplish color. Over time, it is hoped that the virus will slowly infect more and more multiflora roses. A problem with RRV though is that it can also infect native and garden roses, plums and other rose family species like apples. More effective eradication tools might be physical control and/or chemical herbicides. Rose rosette virus from Clemson University. So how did we get in this situation? Blame it on the Dust Bowl. In the early 1930s, a persistent drought in the Great Plains caused massive crop failures and the exposed soil was picked up by the winds and blown in great clouds towards the east. One immense, blackening storm descended on the capital buildings in Washington D.C. on May 11, 1934. This spurred the federal government into decisive action and President Franklin D. Roosevelt, with congressional support, created the Soil Erosion Service, later to be renamed the Soil Conservation Service. One of the goals of this program was to protect our land resources from the devastating effects of erosion and one way to do this was to revegetate bare areas. A number of what we now know to be invasive plants like the multiflora rose were promoted because they grew so well and fast. About the only native plant that comes to mind when thinking about a quick growing one is poison ivy. All the thugs in my gardens are non-natives. They say hindsight is 20:20. We can’t always foresee the results down the road from the choices we make now. But one thing is clear. Our native ecosystems are more fragile and more important than we might suspect and we should do all we can to protect them.